Diesel Only The Brave Tattoo is addressed to a strong and self-confident men. 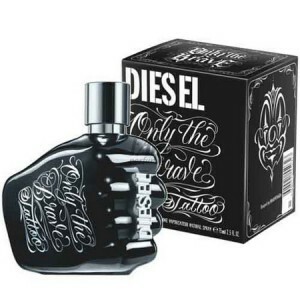 Diesel Only The Brave Tattoo 75ml. Eau De Toilette is addressed to a strong and self-confident men who can afford to do things based solely on their own opinion. The image of the tattoo in the concept of the new fragrance is not accidental, it reminds of the fact that the founder of Diesel Renzo Rosso had the courage to make the first tattoo on his body only at the age of fifty years. perfume compositions Diesel Only The Brave Tattoo opens juicy flavors of ripe apple. At the heart of fragrance notes of sage and pepper Bourbon. In the basis of sound sensual chords of amber, benzoin, tobacco and patchouli. a fragrance for bright and somewhat daring men. The composition, which was published in 2012, rightly attributed to woody spicy group. What is the secret news? Familiarity with the scent begins with notes of red apple, followed by sage and pepper, supported by the Siamese benzoin. Well, where do without a stylish men's fragrance wood components and leaf tobacco. Oddly enough, it's all very harmoniously coexist in one bottle. Like a tattoo on the body composition emphasizes the individuality and uniqueness of the holder of such a smell. Black glossy and compact bottle in the form of a clenched fist with "tattooed" name brand men's eyes clearly not disregard. noble, gorgeous, wood-spicy scent 2012. created for ambitious men who know how to control himself and to dominate others. Opens composition refreshing and sweet mandarin and red apple. In a spicy heart - Bourbon pepper and sage. A sensual base - of patchouli, benzoin, tobacco and wood.